Full disclosure, I’ve owned a CTEK Multi US 3300 battery charger since circa 2004. I’ve relied on it for keeping the battery in my 1975 CB400F charged for the rare occasion when I actually ride the bike. According to my records, the battery in my vintage Honda was also purchased circa 2004. 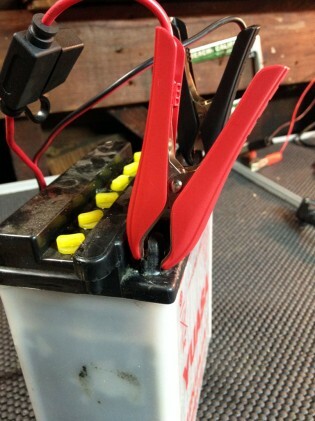 So, for a decade the old CTEK model’s been doing a fine job of prolonging the life of this rarely used battery. Knowing the 3300’s track record, I was anxious to check out the company’s new MUS 4.3 model. Unlike my old 3300 CTEK, the first step of the MUS 4.3’s 8-step process is to diagnose battery health and desulfate older batteries. The exclamation mark in the upper left corner illuminates if the charger is incorrectly connected, if the charging cycle gets interrupted, or if the battery is too sulfated or too old to accept a charge. 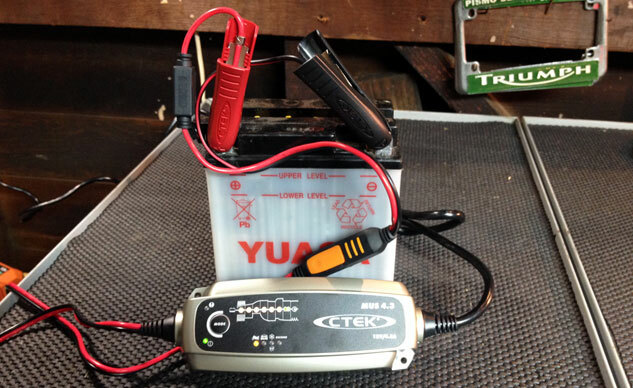 In addition to motorcycle batteries, the CTEK MUS 4.3 is good for charging a variety of lead-acid batteries, such as those in cars, trucks, tractors, lawn mowers, snowmobiles, etc. There’s also a cold-weather program for temperatures between 41 and -4 degrees Fahrenheit, as well as a Reconditioning (Recond) program that maximizes the life and capacity of your battery after deep discharges. 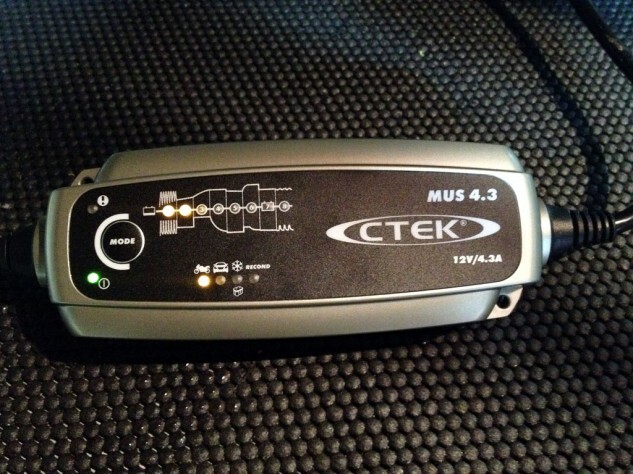 Using the CTEK MUS 4.3 is child’s play. 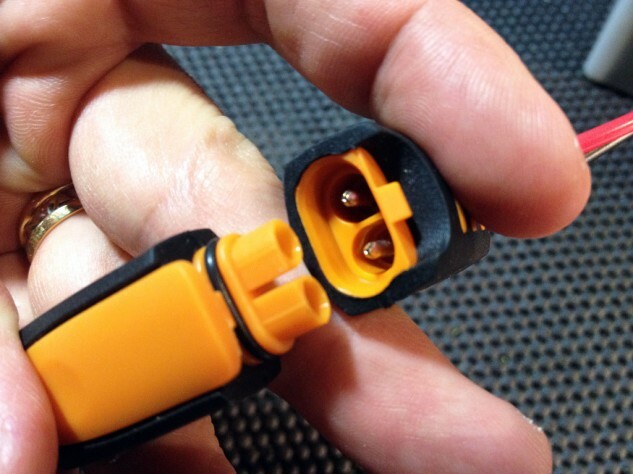 Simply connect either the alligator clamps or eyelet attachments to the main line, attach positive and negative leads to the appropriate terminal then plug the charger into a common wall socket. Press the Mode button to select a charging program (the motorcycle icon in this case) and the charger takes care of the rest. If it detects a battery that is too old or sulfated to charge, it alerts you to the fact by way of an exclamation mark in the upper left corner of the charger. 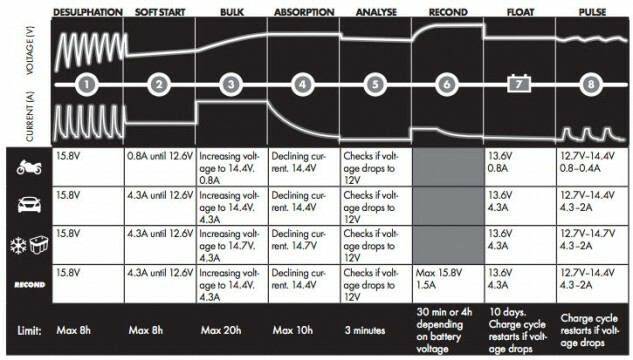 Here the CTEK MUS 4.3 owner’s manual describes the different functions of the 8-step charging process. To prepare my CB400F battery for this test, I, turned on the ignition and left town for the 2014 Ducati Monster 1200S launch on Tenerife. To say the battery was dead upon return is an understatement. Alligator clamps are appropriately sized to attach to a motorcycle battery’s smaller terminals as well as the larger terminals of a car/truck battery. Also included is a pair of ¼-inch eyelet attachments. Note the 15A fuse on the positive wire – a nice safety precaution. Considering its age and amount of times the battery’s been drained of both charge and distilled water, I half expected the MUS 4.3 to illuminate the exclamation mark and tell me the battery was unchargeable, but amazingly, after an overnight charge in Recond mode I awoke to find the charger on stage seven, “Float,” the next morning. Although very similar to the Multi US 3300 model I’ve owned for years, I’m excited (as excited as you can get when it comes to battery chargers) to have this new model with its extra features – especially considering the price increase is a minimal $10.00 — $74.99 for the Multi US 3300 vs. $84.99 for the MUS 4.3. And yes, the 3300 is still available from CTEK. CTEK claims the MUS 4.3 charger is both splash and dust proof, and the company stands behind the product with a five-year limited warranty on manufacturing faults and material defects. In addition to the new MUS 4.3 model, CTEK offers a variety of other chargers including the Lithium US ($119.99) for lithium-ion phosphate batteries, the MUS 4.3 Polar ($109.99) for temperatures as low as -22 degrees fahrenheit, as well as others. For more information about the new CTEK MUS 4.3, other battery charger models or to purchase one go to www.smartcharger.com.